Antique - Gladstone China by George Proctor & Co., An Unknown Pattern. Made from 1924 through 1940 per Back Stamp - Total of (27) Pieces. Gladstone China by George Procter & Co, during the early 1900's, is a beautiful Floral Unknown Pattern, in Bright Blue and Orange Enameling, (done by hand) on a Bright White Background, with a Black and 22kt Gold Band on the Edge of the Rim. All Pieces are trimmed in 22kt Gold on Rims, Verges, Feet, and Handles. Absolutely lovely to look at, but would be also great to use when entertaining your family and friends. Missing only the Creamer. 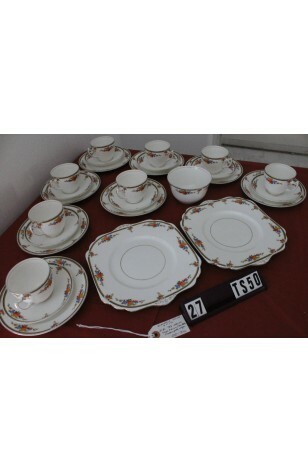 8 - Saucers - 5 1/2"
8 - Bread/Dessert/Tea Plates - 6 1/2"